The original and still the best magnetic drawer filter magnets available. High Strength, fully welded 3mm Stainless Steel Body, capable of symmetrical compression loads of 4500kg. Patented “No Spill” Slide Gate, completely shuts off product flow for safe and clean removal of the drawer for cleaning. Flanges customised to customers own needs, for fast simple fitting. Designed to compliment the Bunting Magnetic MMS Metal Detector and can be supplied as turnkey cleaning station. 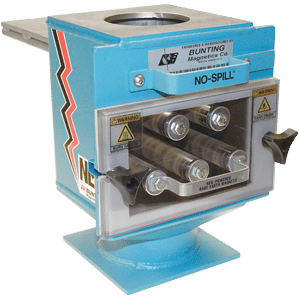 Bunting Magnetics FF Series Draw Magnets are perfectly suited for collecting and separating contaminant ferrous metal from gravity fed, dry, free flowing materials. Housed inside are the extremely strong Neodymium Rare Earth Magnets which do the capturing and holding of the tiny pieces of ferrous metal contaminant. Made specifically for the plastics industry, this is the only available drawer magnet design (exclusive to Bunting Magnetics) that features temperature-compensated rare earth magnets. With that benefit on board, they are compatible with high temperature (up to 80°C) machines like extrusion, injection and blow moulding machines while still maintaining a maximum pulling power. Guaranteeing a level of durability and a reduction in downtime, this particularly impressive series of drawer magnets has been a leader in the industry for more than 40 years. Featuring a 3mm stainless steel , fully welded , housing which has been built in order to support symmetrical compression loads of 4,536 KG. The draw gasket which is designed to resist heat aging and compression set is cut from Ethylene Propylene Diene (EPDM) and allows for greater durability. Although entirely optional, the ability to order the FF Series Drawer Magnets with either a self-cleaning or continuously self-cleaning option means that any production downtime can be reduced significantly. A detachable tramp tray, which comes as part of the self-cleaning model, means that spillages and clean-ups can largely be avoided. No-Spill Side Gate (1) – This effectively switches off the product flow. When the drawer is then removed for routine inspection or cleaning there are no concerns regarding health and safety or spillages. Purge Hopper (2) – This is put into use when changing colour or compound. It means the equipment can be cleaned without the need to empty the hopper. This will also mean that magnetics protection won’t be sacrificed. Dump Tube (3) – Designed to totally empty the draw housing and the material hopper once a plastic run has been completed. Liquid Port (4) – This port essentially has a dual purpose. It can hold a temperature probe but primarily it provides a means to inject liquid colour additive into resin. Powder Seal Kit (5) – Limits any leaking of powdery materials by putting a compression seal around the slide gate. 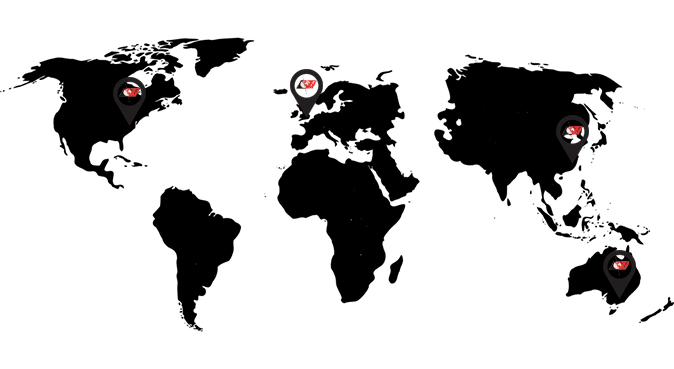 What Can Your Magnet Pick Up from Bunting Magnetics Europe on Vimeo. NO wiping or Brushing Required! Outstanding magnetic separation, with various magnetic configurations for all types of gravity flow applications. Configurable design to suit the flow of materials and separation required. High duty construction, for long life. Large range of sizes, magnet types and finishes available. Bunting HF Series Drawer Magnets are equipped with powerful magnetic cartridges to handle a wide range of separation tasks in mechanical or gravity flow applications and have been specifically designed remove and hold metal contaminants from gravity, free flowing or mechanical fed materials that are inside enclosed flow lines. They can be used for a host of different applications in a number of different industries, such as pharmaceutical, grain, powders, plastics and food. Different grades of Bunting Magnetics magnetic cartridges are built into the design of these particular magnets and can be tailored to individual site requirements. To increase the level of contact with the product stream, which in turn increases the level of separation possible, the HF Series Drawer Magnets can be arranged with two or more trays of staggered cartridges. As the product in question goes into the HF Drawer Magnet, any metal contaminants that are ferrous are attracted by and then collected by the strong magnetic cartridges.. The magnetic field then holds these contaminants in place until cleaning takes place. HF Drawer Magnets are fairly flexible, which means a number of different options are available and can be applied. Choose from a standard or sanitary construction and in addition they are available with rare earth, Alnico or Ceramic magnets. They can be configured with two or more cartridge trays arranged so that the cartridges are staggered to increase contact with the product stream. Material moves in a zig-zag pattern from one cartridge tray to the next for exceptionally thorough cleaning. HF Drawer Magnets are available in utility, food, and sanitary construction grades with multiple cleaning options and stainless steel housings. We supply custom transitions to match your round, square, or rectangular spouting. In the standard configuration, ferrous debris is removed from the cartridges by sliding the trays out of the housing and wiping them off by hand. Single and Double row heights are standard , but up to 5 rows can be incorporated. Magnet spacing of 75mm is also available for products that easily bridge. Self-Cleaning HF Drawer Magnets are designed for maximum magnetic strength , which a tube over tube design does not allow. The extend high intensity magnetic cartridges are pulled outside the housing, where Bunting Magnetics high performance grommets wipe the tubes clean all the way to their nonmagnetic tapered ends. This ensures that each cartridge is fully cleaned and prevents captured tramp iron from re-entering the product stream. Pneumatically powered cleaning mechanism releases ferrous contaminants into the discharge area automatically. Pneumatic units can be installed in hard-to-reach locations because they operate at the touch of a remote switch or by a Bunting-engineered automated control package. With this model, product flow must be stopped to clean cartridges and prevent contaminated products from flowing into product stream. Because of the special drawer design, the product continues to flow while magnets are being cleaned. There is no need for a gate to stop product flow. Each row of magnets are cleaned in an alternating pattern allowing the product to remain in contact with a row of magnets at all times. This unit operates by remote switch or by a Bunting-engineered automated control package allowing it to be installed in hard-to-reach locations. BPI Minster Films in Leominster has recently installed a series of Magnetic Separators supplied by Bunting Magnetics Europe Ltd. The Magnetic Separators capture any ferrous metal contamination in the process, preventing equipment damage and production downtime.